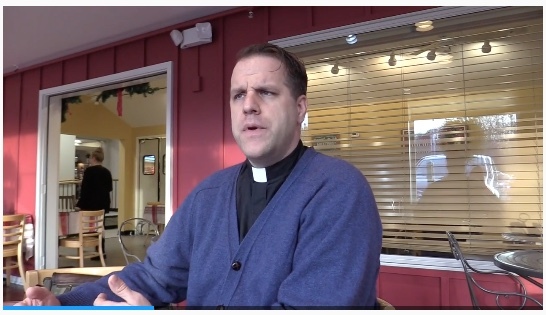 Wounded Times: Iraq Veteran Chaplain Betrayed by Catholic Church Because of PTSD? Iraq Veteran Chaplain Betrayed by Catholic Church Because of PTSD? Iraq Veteran Betrayed by Church Over PTSD? Most of my life has been dedicated to veterans and PTSD. For over 3 decades, every true expert on PTSD has said that spiritual healing is vital, especially when the person afflicted by it, came with their job. It takes a very special person with a strong emotional core to not just do their jobs, but even think they should do them in the first place. They are pulled to do them. Knowing all the hardships, as well as the risks, did not stop them from putting their lives on the line for someone else. That is how much life mattered to them. Rev. Robert Repenning knows what that is like. He also served as an Army Chaplain in Iraq. He spoke about God's love and he showed the compassion of Christ as well as what courage is like on behalf of the Church. Too bad the Catholic Church did not notice faith was spread by people just like him when Jesus sent out the 12 others. At least that is the way I thought it was supposed to be. How can the church, or any house of worship claim they care when they refuse to send someone who not only understands what our veterans are going through, but lives with it, walks the walk and still has the same connection to God? Why is it they were so ready to turn their backs on this veteran when so many others should be welcomed into the healing power of God's love? I am with Point Man International Ministries because they believe as I do. They go out and minister to those in need of healing, just as Christ said it should be done. To think that this message has been sent out to all those who put their lives on the line for the sake of others, proving the greatest level of love their is, a betrayal of the mission they took an oath to fulfill. The topper in all of this is, he is fighting to stay in the church and continue to minister to Catholics instead of walking away to go to another denomination that will not just welcome him, but value the help and hope he can offer so many veterans. Meanwhile, "if I defend myself, they say I'm attacking the archdiocese," Repenning added. For the past 18 months, the Rev. Robert Repenning has had no church to call home, no parish to serve. "In a spiritual sense, it's devastating not to have an assignment," said Repenning, a longtime local Roman Catholic priest and former Army chaplain, who served in the Iraq War. "I want to be in a parish." Repenning, 45, says the archdiocese has discriminated against him as a disabled veteran because of the alleged severity of his Post Traumatic Stress Disorder. His contract at Holy Trinity in Poughkeepsie, which he led for a six-year term that ended on July 1, 2016, was not renewed. Cardinal Timothy Dolan has told Repenning that he has a "grave lack of any self-awareness... that you may have deep problems," according to correspondence Repenning shared with the Journal. It's a “moral obligation, and a fraternal desire” of Dolan's to ensure Repenning is healthy, and “to do this, we need a professional assessment best done in a residential setting," the cardinal wrote in a 2016 letter to Repenning. Repenning has said he did not agree to seek treatment at an archdiocese-approved facility and that he's already been receiving medical care at the Castle Point branch of the Veterans Affairs Hudson Valley Health Care System. Since his leave began, Repenning said he's had psychological and physical tests completed, and his doctors have no concerns.